The original visions we considered way back at the start of what is now the Tesla project entwined mechanical elements with creative ones. That has constrained our process throughout Exploratory Design and for that reason I've made an effort to leave creative elements vague in the interim. But as we near the beginning of Design proper, we need to address at least one creative concern: what level of technology is okay in a Magic: The Gathering expansion? Tesla has a theme of progress which naturally evokes the industrial revolution, the fiction it inspired, or our own futurism. 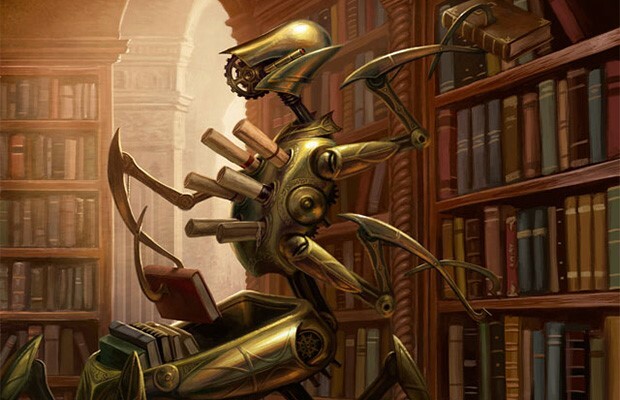 The highest levels of technology we've seen in Magic were in Mirrodin, Innistrad, Portal Second Age, everything involving Urza, and most recently, Conspiracy. It's pretty clear that the lever is okay and the other kind of Tesla isn't, but what about steam boats or assembly lines? Where do we draw the line between what's fantasy and what isn't? Different people are bound to have different philosophical stances, so consensus will have to be our guide: what still feels like Magic to the vast majority of players? I think the upper bound, technology-wise, would be Da Vinci style machines. Regardless of whether or not we decide we can go higher, I really like this aesthetic for "high tech" in Magic. I think that Conspiracy is pretty much the limit, and that this constraint is basically incompatible with the themes of Tesla. It's most of why I haven't participated. I'm pretty confident that we could execute perfectly well on Tesla's themes ON the plane of Fiora with with the development of cogwork if need be. Tesla needs something that feels like technology advancing, not necessarily like advanced technology. Nice! Hadn't occurred to me, but yes, if we don't conclude we want anything too incompatible (say, post-apocalyptic), then going to Fiora makes a lot of sense. Everyone knows that any significantly advanced technology is indistinguishable from Magic. Personally, I'd say Power Armor and the original Urza's Rage represent the limit of Magic technology. Guns themselves are out, if only because close quarters combat is much better to depict and interact with. White - Apple: The white faction believes that the best technology is that which works together in uniform harmony. Its Products are sleek, white, clean machines. Imagine Elesh Norn without the blood and Viscera. It's weakness is that it's locked down, resistant to change. Blue - Google: This faction is consumed with a lust for knowledge, but tends to focus less on mechanical prowess. It's Products are large, spindly spiders and, of course, Mechanical Clouds. They're attacks are more of the hacking variety, attaching themselves to the other bots to take them over. Black- Microsoft The epitome of function over form. Their behemoth products spew black smoke, and are cobbled together from whatever their engineers find useful. They are terribly inefficient, but none the less pack a ton of punch. Red - Amazon: The red faction is all about speed and efficiency. They want to get their products out quick, and if it fails reuse its parts for the next new thing. They're not the most organized Monopoly, and their small products might seem poorly built and going in a million different directions, but before you know it there's no competition left. Green - Facebook: Green in most artifact worlds is the outcasts, shunning technology. In this world Green realizes that technology works best when it brings people (and animals and plants) together. Green's products are networked collectives of elves and beasts. These guidelines might not be enough to get entirely away from Mirrodin. There are certainly going to be similarities. It's even possible that it's just better to imagine these factions in New Phyrexia where they'd be a pretty logical fit. But i think part of the difference would be that this world doesn't have the "horror" feel of Phyrexia. The combat is more ritualized. It's more Robot Wars than Terminator. The world has divided itself into these various factions but they do battle by proxy. A lot of the power crystal technology felt a little bit over the line to me, but if it sits well with others I could definitely see making that the basis for Tesla's tech. I like the philosophical lines for the corporations, but the overall structure isn't grabbing me. I'd love to be convinced it's a good fit. I'd propose that anything in widespread use before (say) 1900-- including trains, rifles, assembly lines, and electric lighting-- could be fair game for Tesla, with the important caveat that they'd be powered by magic rather than technology per se. So, for example, instead of guns we might have magically enhanced crossbows. That would be pushing the envelope quite a bit, but I think it would still work for Magic flavor-wise. Out of the four comments so far, this is the one that best reflects my opinion. Rifles in particular would be best avoided as they're famous for showing up in Portal 2 and putting people off, but goblin-style Rocket Launchers and cannons (as on pirate ships or Goblin Cannon etc) are fine. "what level of technology is okay in a Magic: The Gathering expansion?" An official expansion is whatever Wizards of the Coast deems appropriate. A fan-made expansion is whatever the creators and/or audience deem appropriate. Take comics and superheroes. Why do Batman and Joker, who have no superpowers, fit in a world of heroes and villains with superpowers? Same for Ironman who relies on cutting edge technology to rival "magical" superheroes. In other words, as long as you create a world that is sufficiently self-consistent. Multiverse is a 'verse of infinite possiblities. One such possibility is where technology far surpasses magic (maybe due to scarce mana sources.) Or where mana is harnessed to drive technology and makes it widespread. In Earth terms, mana could be our energy. Different types of mana or energy is created in various ways and from different sources. e.g. white mana = solar energy, black mana = oil, red = electricity, blue = hydro/wind, green = biofuel. In such a world, technology keeps advancing due to the inventiveness and practicality of having machines do most of our work, and thus civilization and life styles eventually advanced to something like Industrial Revolution and beyond. How about turn of the 20th century so that aeroplanes clash with the dragons for control of the skies. From such a world would also borne atypical planeswalkers than other planes. Such as an Ironman-esque hero (even more technologically advanced and capable than Tezzeret). Or a maverick that fights with pistols (and unlimited bullets, natch ;p). Or a greedy businessman looking for new sources of oil (would Phyrexian oil work?). As far as it impacts what we learn as game designers, how appropriate the theme is to Magic is irrelevant. The project will not be seen be Wizards employees, not will it be sold to Magic fans. We'll show it off to whomever we can, but ultimately, the goal is not the end result but what we can learn in building it. So whatever theme excites the team most is best. The one exception I see is if we have a team that wants to do the Creative work alongside our Design work, in which case that team will learn more by challenging themselves to follow the same parameters the Wizards Creative team would. In that mode, I'd allow any fictional technology other than guns, and no historical technology beyond the renaissance. In theory you're correct, but I think this is actually an important design constraint to practice under. Ignoring it gets us things like Trepanation Blade in Innistrad (which Richard Garfield designed as Chainsaw). Since that concept had no place in the creative vision we just ended up with a card that didn't fit at all. That slot could have been better used for something else. Anything we ever design with a creative component needs to feel cohesive. Flavor is flexible, and for a new game we might even be able to work out almost all of the mechanics before pinning flavor down. But designing an expansion or top-down game can make flavor a major constraint. * A personal forcefield sustained by the familiar on your shoulder rather than a mechanism. * Steamboats with an elemental in the boiler rather than coal. * Flying ships with magical feathery wings rather than sails and rudders. * Giant robots, powered by mana infused power crystals rather than batteries. * Street lights lit by tiny faeries rather than gas. * Personal augmentations that use intricate tattoes rather than circuit boards. * Brass diving bells with fins and tentacles rather than thrusters and grapple arms. * Cannons that shoot little live creatures instead of bullets. * Beebles as invincible Test-Dummies to test new items. Basically, the more technologically advanced the item, the more obvious the magic component should be. Cameras that have an Imp with a paintbrush inside? I dig this a lot. We can pull off pretty much any level of technology as long as it's super obvious that it's magically powered and not technologically. The principle - "the more advanced, the more obvious the magic should be" - is good to work with. This is a really clever approach! I'll also second Inanimate's support of your guiding principle.